In addition to the comprehensive range of flexible picture hanging systems STAS also offers a wide range of modern picture rail hooks, adjustable picture hangers, security hooks, partition wall hooks, picture hooks and accessories. 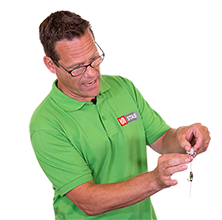 The video below shows you how to hang pictures without nails, when using our picture rail hooks. Take a look at the STAS hooks and cords. With the patented STAS cobra you can hang your pictures, paintings and wall decorations flexibly, in no time, without nails. The perlon cord is virtually invisible and the steel cable, also available in white or black, is suitable for hanging heavy wall decorations. The STAS cobra can be used for almost every STAS picture hanging system. When the rail is mounted on the wall or ceiling you can hook the STAS cobra into the rail at the desired spot. This way you can easily rearrange your pictures time and time again, without using any tools. One of the most common picture rail hooks used with the STAS cobra, is the STAS smartspring. 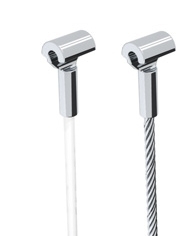 The self locking picture hook slides onto the virtually invisible perlon cord. You can slide it up and down easily to the required height. This allows you to adjust the height at any time, without any tools. The STAS smartspring can carry weights up to 4 kg (8.8 lbs). Another hook which can be combined with the STAS cobra is the STAS zipper. 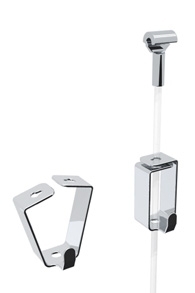 This hook is ideal for hanging heavier picture frames and paintings. 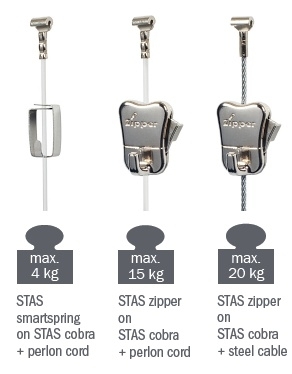 The STAS zipper can be applied to a perlon cord as well as a steel cable. The STAS zipper on perlon cord can carry weights up to 15 kg (33 lbs) and weights up to 20 kg (44 lbs) in combination with a steel cable. Learn more about the various available picture rail hooks and cords.